Temperatures are still chilly for now. But with spring on its way very soon, you know how fast the weather can turn. Soon enough, you’ll need your air conditioner on a regular basis in order to stay comfortable in your home. So, that means you can shut off your heater once heating season is over and forget about it until next year, right? Well, sure, if you had it maintained before winter began, you had no problems with it over the season, and it has no repair needs. But neglecting your heating system when you actually need work done on it can be detrimental to the system, leading to potential safety hazards if you’re using a gas powered system, and leading to the possibility that your system will completely die on you next fall when you need it again. The heater is making strange noises, such as groaning, banging, or whining. The heat isn’t coming through as powerfully as you think it should be, even when you turn your thermostat up. Your energy bills have increased from this time last year, even though you haven’t used it any more than last year. Your furnace is struggling to stay on or turn on. The furnace keeps running without cycling off. There are a number of reasons your heating system might be displaying one or more of the above-mentioned problems. It may be something simple, like a thermostat issue, and not a problem with the actual heating system at all. Even though this isn’t complex, or even an emergency, it’s not a problem you want to ignore. After all, in order to effectively use your air conditioner this spring and summer, you’ll need an effective thermostat! Other possible heating repair needs crop up due to breached ductwork, clogged air filters, or even electrical issues in your heater’s mechanical system. Neglecting these problems can cause them to become worse. It’s best to tackle heater problems as soon as they come up, so you can avoid larger, costlier, heating emergencies later on down the road. Not every heating system repair can be prevented—that’s inevitable. However you can reduce the risk by scheduling routine preventive heating maintenance at least once a year (or twice, if you’re using a heat pump). During your maintenance appointment, our professionals will fully inspect and clean your heating system, making any necessary adjustments to the system. 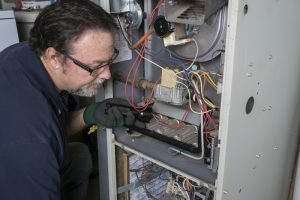 This service ensures that your system continues to work as efficiently and effectively as the day you got it (well, a little efficiency will drop, but only by about 5%.) Addressing problems now is much more beneficial than waiting and risking a bigger emergency with your heater. When you need heating services, you want a Cherry Hill HVAC company you can trust. Look no further than Ambient Comfort! Contact us today.